Our 9AM Sunday School classes will not meet this week and our 10:30 worship service will be moved to the gym at Sun Valley High School. We received word this week that the Auditorium and classroom hallway at Sun Valley will again be without power this coming Sunday, March 10. Because of this, we will be worshipping in the new gym again at Sun Valley at 10:30. We will not be having Sunday school. Just like Feb 24, parking will be different again this week. 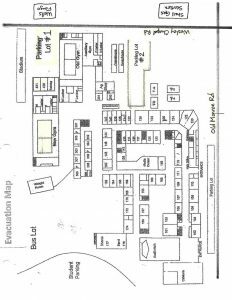 Please see the campus map below. To park, please enter Parking Lot #1 or Parking Lot #2 from Wesley Chapel Road. Parking Lot #1: Should be used by our senior citizens, families with small children, and for those who are handicapped. This lot is located directly across the street from Wells Fargo on Wesley Chapel Road. Parking Lot #2: Everyone else should use this lot. It is located across the street from the Shell gas station on Wesley Chapel Road. Our deacons will be there to guide everyone. We will have two classrooms for children Birth – 1st Grade. Children ages 2nd Grade and up should stay in the service. Worship will begin at 10:30 a.m.
Once again, I thank you all for your flexibility this Sunday. Please let the church office know if you have any concerns.